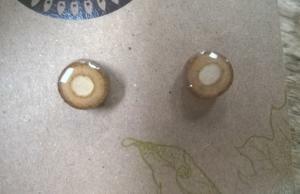 Two of my favorite activities are hiking and shopping, so it was serendipitous when I came across these stud earrings at the greatest gift, This unique (and very affordable) piece of jewelry is created from oak twigs picked up off the nearby Appalachian Trail and designed to bring out the beauty of the wood. Each pair is different and hand-crafted in Carlisle meaning that you get a one-of-a-kind memento of your visit. Located in historic downtown Carlisle, the greatest gift is a boutique shop selling imaginative and creative gifts -- including jewelry, pottery, clothing, artwork, soaps, home decor, and more -- from more than 50 artists. 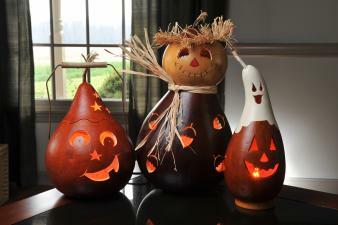 My favorite hand-made items in the Valley are the adorable creations from Meadowbrook Gourds. Located on the outskirts of Carlisle, this former potato farm now grows and crafts hundreds of varieties of seasonal gourds. The showroom features a wide variety of designs including Easter baskets, angels, woodland creatures, jack o lanterns, birdhouses and more. Stop by on a Tuesday for a free tour of the facility, and keep an eye on the event calendar for Open House weekends and special events that offer opportunities to create your own gourds, pick sunflowers (seasonal) and see live music. If you are here on a Thursday, Friday, or Saturday, plan a visit to K. Olson Ceramics on Pomfret Street. The cozy storefront features a collection of items including plates, mugs, vases, crocks and more, made by the owner and a few other select artists. Each item has a unique twist with a big personality, and many of the pieces feature earthy colors and designs. One of my favorite parts about the store is the drying rack located right on the sales floor full of new items headed to the kiln. The wide selection of American-made fine art and craft sold at Village Artisans Gallery in Boiling Springs reflects such a high quality of craftsmanship and creativity that it&apos;s hard to choose just one special item. 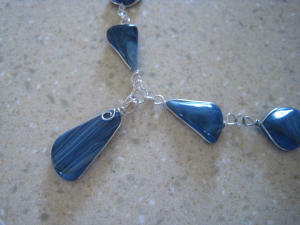 However, the jewelry by Joan Rhoads always intrigues me. Among other unconventional objects, Joan works with slag, a by-product of the historical iron furnaces in the Cumberland Valley, to create beautiful pieces that can be worn every day. I am always fascinated by the fact that she can pick up an object off the ground and craft such eye-catching and unique pendants and earrings. In addition to slag, Joan uses bits of broken automobile glass in her Precious Metal Clay jewelry and also works with semi-precious stones. She is often a guest artist during the Artist in Action series hosted by Village Artisans Gallery. When admiring Joan&apos;s work, be sure to check out the other jewelry for sale by artists Melissa Colucci, Leslie Halaby-Moore, and Richelle Dourte.